I was originally inspired to make this piece after seeing the work of sculptor, Bart Walter. 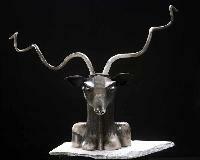 Walter�s naturalistic bronze sculptures of endangered West African animals depict the spirit. They remind us that we are all, animals and humans, interconnected and interdependent. �Shaman� is about the interconnectedness of all nature, including the microcosm within. 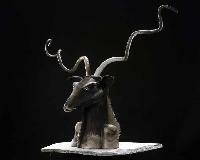 The female human wears the head and horns of the male kudu antelope in order to demonstrate the successful integration of seemingly opposite characteristics. Ultimately, this piece is meant to symbolize the �Shaman's� ability to walk in both subconscious and conscious worlds, to bridge the gap between the known and the unknown � the visible and invisible. This transformative power brings the potentially healing energies of the invisible world of spirit into the material realm of the here and now.